Item: Monday’s announcement by 2018 Connecticut (N.J. native) big man prospect Osun Osunniyi that he had chosen St. Bonaventure over Syracuse (and Georgetown), figures to end the post-season work on finalizing the 2018 SU roster with the April subtraction of highly touted power forward Darius Bazley, and the May addition of under-the-radar power forward Robert Braswell. 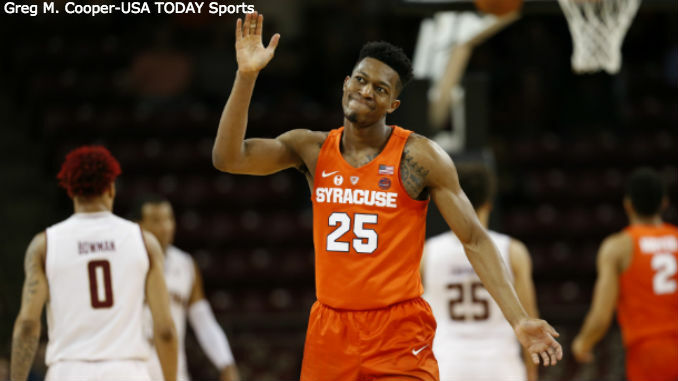 It’s now eight days and counting until the May 30 deadline for Tyus Battle to inform the NBA if he plans to remain in the draft, or return to the Orange to bring the NCAA Sweet 16 starting five back intact. With Syracuse not having any player selected in the NBA draft in just four years so far this century, the coaching staff has been used to looking for recruits during the spring late signing period, and even into the summer to fill a roster spot and add depth when others finish their eligibility or leave school early for draft inclusion, or transfer. The transactions this spring with Matthew Moyer’s transition to Vanderbilt, Bazley’s eye-opening decision to head right to a professional development career in the NBA’s G-League, and the ‘Cuse coaches courting big men and winning over Braswell and his family with a pitch of a “family atmosphere” and time to get stronger and develop, leaves the last step of trying to figure out which way Battle may be leaning with just over a week to decide. Opinions from NBA player personnel executives and the media were mixed on Battle’s performance at the draft combine which ended this past weekend. The consensus seemed to be that while he showed athleticism and strength, Battle did not show enough to distinguish himself from the other scoring guards who surprisingly stood out, or demonstrate the overall skills necessary at both ends of the court to be a first round pick. Whether it’s first round or bust for Battle and his family determining what’s best for his next basketball step, he figures to benefit either way. In the short term there’s at a minimum the possibility of a limited guaranteed six figure deal as a second round NBA pick and realizing the goal of starting a pro career. Long term, Battle knows exactly where to concentrate on improving his game which simultaneously will come at the benefit of the SU program, with the goal to improve enough over his junior season plus the exposure of another deep NCAA run to pave perhaps a smoother road to the NBA.